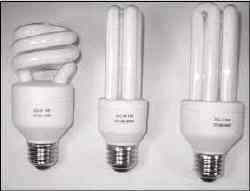 CFL lamps provide very high illumination levels with an 80% savings in power consumption over incandescent lamps. These high quality DC lamps are designed to be used in 12 volt and 24 volt battery systems. Cool-white 6400°K lamps provide a bright blue-white glow. Warm-white 2700°K lamps provide a light similar to incandescent lamps. The life span of the lamp is more than 6,000 hours. A special electronic circuit guarantees more than 50,000 switching cycles. The lamps have a standard E27/Edison socket. Spiral lamps are ideal in locations where the U-tube lamps are too long.